We’ve got all sorts of activity at the U Pick this Sunday! You can come any time between 10 a m and 5 pm to pick your own variety of herbs for $8 a gallon bag. If you want to get in a short presentation on permaculture and herb growing in Montana that will be from 1-2 pm. Bring a lunch or sign up ahead for the Volunteer Learning Day and one will be provided. 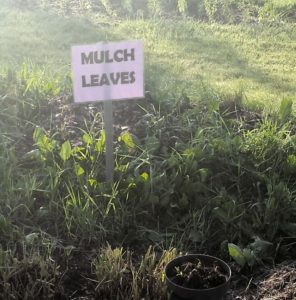 You can also get free herbs in an $8 certificate by: 1) just spending an hour weeding or 2)bringing a big bag or pile of leaves with you for our permaculture mulching project. Spend a little or a lot of time with us Sunday, we’d love to have you! Contact us for directions, questions or to sign up. You’ll see a sign out on Mallard Way and Mullan Road.